There are two men in front of me at The Purity checkout line on a Tuesday afternoon—two of the legions of young adult males with no visible means of employment. 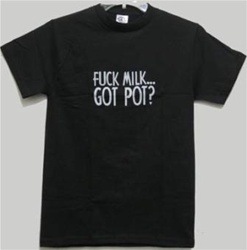 Pot growers? Occasional construction workers? Drug dealer?. Who knows? My mother is obsessed with reading bumper stickers. Since I am no way like my mother, I obsessively ignore bumper stickers. However, wear a tee-shirt with something written on it and I’ll follow you around until I can decipher what it says. One of the gentlemen is wearing a black tee-shirt with bold white lettering. He stands sideways to me, but as he moves, I see the “F” word. I will never move away from here. This entry was posted in Fort Bragg California, Grocery Stores, Humor, Purity Market, Small Town and tagged Got Milk, Pot, tshirtgeneration.com by Kate. Bookmark the permalink. Hmm seems like wearing that shirt would make him an easy target for the police. Seems like wearing this shirt would make him an easy target for the police. Just saying.